Published by Black Rose Books, 2019. I first personally encountered the astutely incisive work of John Grande, apart from knowing of his extensive and impressive history as a critic and curator, when I interviewed him at CJRT-FM Radio in Toronto when I was the resident art critic there. It was about 1994, and we engaged in an informative and illuminating discussion about his then-new book Balance: Art and Nature. On the surface, it was about what had commonly come to be called ecological art, often either in large scale sculptural installations in a natural setting or else visually referring to nature and its collision with our cultures. Beyond eco-crisis however, it was also a celebration of art as embodied meaning: a haptic experience involving both human touch and intellect in harmony with each other. I call it a discussion because though ostensibly in the traditional radio format of questions and answers designed to elicit background on the author and art which could both challenge and entertain the listener with only our words to guide them forward, towards the writing and images it celebrated, it was more. True, it was an interview, but it was also a dialogue, a conversation, an exchange of both energy and ideas, and even a linguistic map capable of achieving what the classical Greeks called ekphrasis: the evocation of the visual experience using language as a device to elucidate understanding of how a certain art work feels. Art is designed to alter our perception of the reality in which we find it, and some critics can clarify that alteration. Therefore it was with a combination of professional and personal pleasure (twenty five years after I first interviewed him) that I came upon Grande’s newest book and found in it a range of his own insightful interviews with twenty important contemporary artists about the origins and intentions of their work. 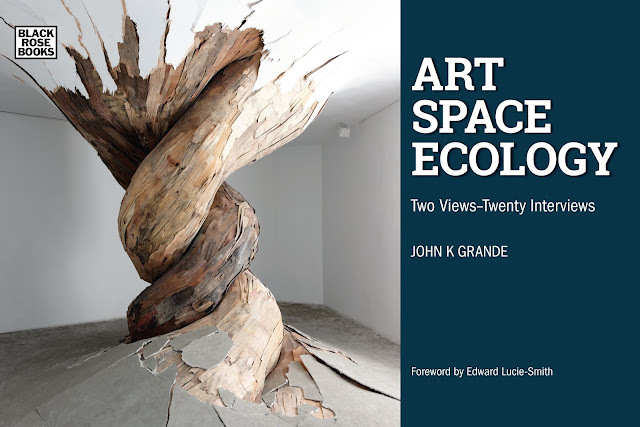 The title of Art Space Ecology: Two Views/Twenty Interviews, tends to capture some of its context and content in an ideal manner. The two views are, first and foremost, the perceptual and conceptual frameworks brought to bear by an encounter between a great artist and a great critic, and secondly, the new territory opened up between their relative positions and perspectives. This is top-shelf ekphrasis in action, folks. I fell for P.G. Wodehouse’s Jeeves novels when I was twelve or thirteen and a friend who’d succumbed before me passed one onto me. I believe it was Right Ho, Jeeves (published in the U.S. as Brinkley Manor), and I was thoroughly smitten – by the sublimely ridiculous plotting, the cast of caricatures, the distinctive language of the upper-class and upper-middle-class eccentrics, and above all the relationship between Bertie Wooster, the fumbling, cracked-brain young protagonist and his unflappable, endlessly resourceful valet Jeeves. Around the same time I discovered that Wodehouse and Guy Bolton had written the books for a series of Jerome Kern musicals in the late teens and the twenties – the ones that preceded Kern’s ground-breaking collaboration with Oscar Hammerstein II, Show Boat – and he became one of my literary heroes. Robert and David Goodale cottoned onto the Jeeves books (there are eleven, in addition to several collections of short stories) in their twenties and Robert fashioned two of them into one-man shows, the second directed by David. Jeeves and Wooster in Perfect Nonsense, their third adaptation, which Hartford Stage is producing currently, is a three-hander in which Bertie (played by Chandler Williams) relates the story of The Code of the Woosters, the sequel to Right Ho, Jeeves, acting it out with the aid of Jeeves (Arnie Burton) and Bertie’s Aunt Dahlia’s manservant Seppings (Eddie Korbich). 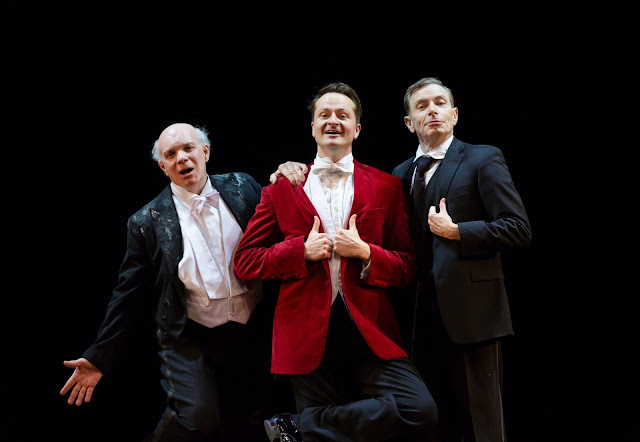 The conceit of the play, which has been staged by Sean Foley, is that Jeeves provides the theatrical appendages, like a set that either he or Seppings rotates with the aid of a bicycle, while the two men between them play all the other roles. That is, Perfect Nonsense is a play in the mold of the fantastically successful 2005 adaptation of The 39 Steps, where the audience watch the actors shifting madly from one role to another with not only comic pleasure but also the appreciation we’d accord a magician’s sleight of hand or an acrobat’s dexterity.